LESS THAN A DAY TO GO! If you are going to support, it's time . . . Read down to the stretch goals, and see Update 16, to see what's in the box! If you need more detailed lists of each reward level, see Update 26. Ogre was the first game I ever designed. It came out in 1977! It’s been out of print for years, except for the miniatures rules. I’m constantly getting requests to bring it back, and in 2008 we started working on a new edition . . . a “designer’s edition” that would be as big and beautiful as any wargame you’ve ever seen. Even as planned right now, the game is huge. The current prototype weighs 14 pounds! There are three huge maps - one 17" x 21" Ogre map and two geomorphic two-sided G.E.V./Shockwave maps. The hexes are 1.5" across, with counters to fit. And the Ogre and building counters are 3-D models made of heavy cardstock. There are already about 40 square feet of chipboard in this game. We couldn’t sell this for $100 if it weren’t for the cash that Munchkin has brought in (thank you, Munchkin). But it’s something I want to do. - First, our margin on this game is low, so we had to be conservative in our plans. We couldn’t put a 10-year supply in the warehouse. We were going to print only 3,000, which is the absolute minimum we were sure of selling in a year or so. There would probably not have been expansion sets, or even a reprint. Something that’s expensive to do at 3,000 units is impossible at 1,000! - Second, because I got literally hundreds of requests to pre-order the game, and we don’t do pre-orders. When we get our new shopping cart set up, sure . . . but that won’t be any time soon. By using Kickstarter, we get a pre-order system automatically. And, because so many people said they wanted more than one copy, we’re offering options for two and even three. Our actual funding goal was low - only $20,000. We're long past that now! So please support us. Help us show that classic wargames aren’t dead. And remember the guys you played Ogre with in high school or college? Let them know so they can reserve a copy too. Spread the word! Thank you. It means a lot to me to be able to do this, and with your help, I can. UPDATES! Remember to check our updates (see the blue box at the top of this section). We have posted more info, news, files, video . . . and we will keep updating. FIND OTHER GAMERS! With our uncreatively named Store and Gamer Finder at http://www.sjgames.com/storefinder/. Look at all the freakin' extras! Any supporter may add any number of these extras to his support level, depending on his shipping address. You’ll have to add the indicated amount to your pledge. When the project closes, we'll send out a survey to all the backers, and you'll use that to tell us what extras you wanted. All the extras listed below ship free within the US. International supporters, you can get them all EXCEPT the Extra Counter Set by picking an International Shipping box (listed at the end of the Extras) that will hold your selection. Afterward, while supplies last, Warehouse 23 will carry these extras . . . but Kickstarter-exclusive items will only be shipped to names/addresses we find on our Ogre supporter list! All embroidered. All, by surrrrvey demand, Velcro backed. $5 each. We will manage to fit up to 4 patches in addition to any recipe listed for any flat rate box. Image here. PANEURO - 3” round, Paneuropean helmet logo, blue on white, which is NOT what the picture shows. COMBINE - 4” high x 2” wide (more or less), Combine hourglass logo, red on black. Not what pic shows. 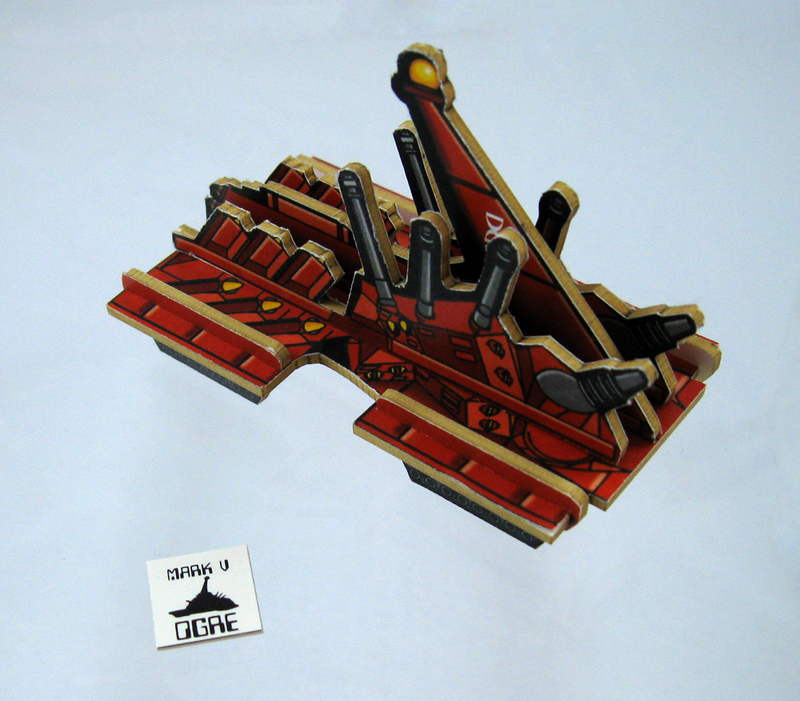 OGRE - 3” wide, NOT the square shown in the image but more similar to the green one beside it - black Ogre silhouette above red OGRE logo on white background. 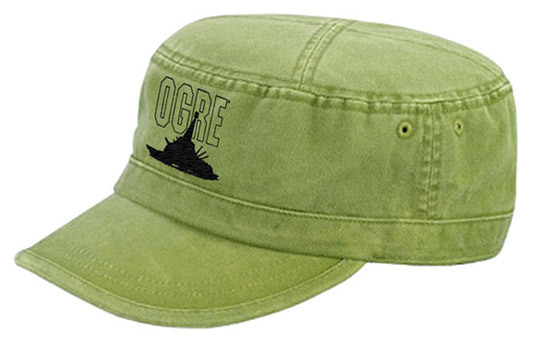 OGRE GREEN - As shown - all embroidery is black and the background will be dark green or OD. 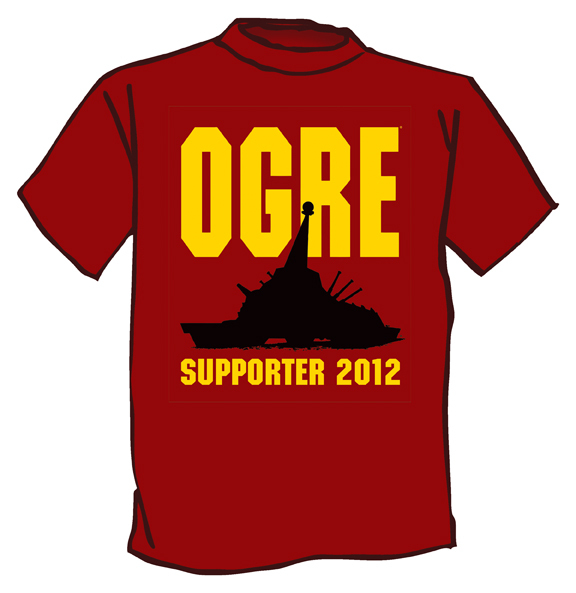 * "Ogre Supporter 2012" T-Shirt – $20. (US free shipping, and see new International Shipping below.) You will specify the size you want in the survey at the end of the project. 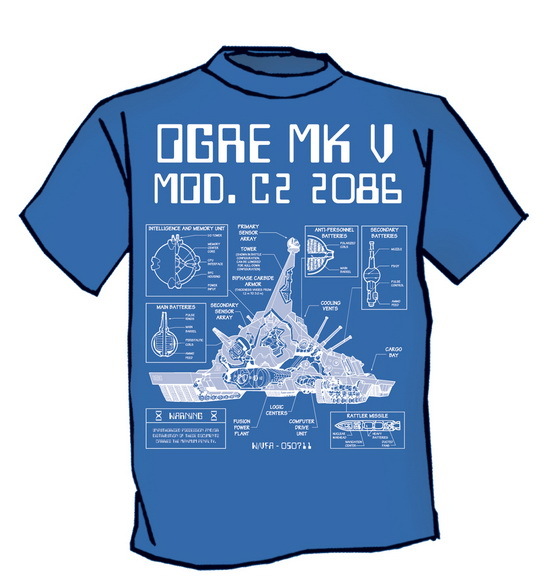 * "Ogre Blueprint" T-Shirt – $20. White on blue, as shown below. (US free shipping, and see new International Shipping below.) You will specify the size you want in the survey at the end of the project. 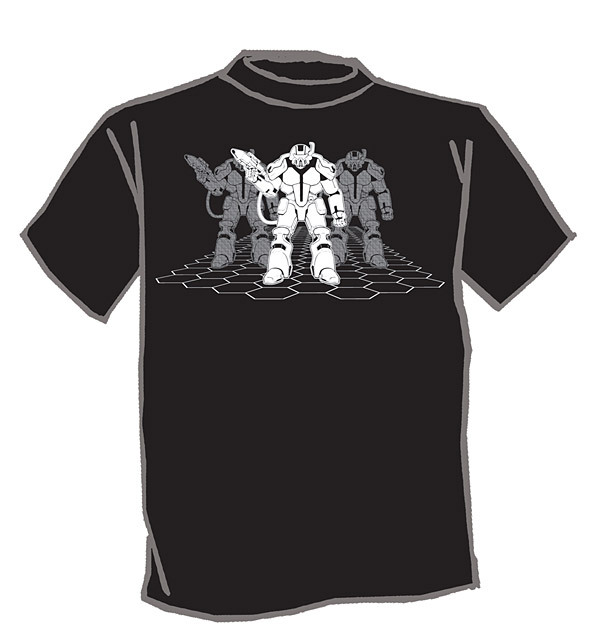 * "Battlesuit" Shirt, US Addresses Only – $20. White on black. No words, just big guns. (US free shipping, and see new International Shipping below.) You will specify the size you want in the survey at the end of the project. * "The Ogre Pursues" Shirt – $20. Illustrated by John Kovalic. You will choose brown ink on tan, white ink on black, or white ink on royal blue. (US free shipping, and see new International Shipping below.) By decision of the surrrrvey, we will add an impage of the Ogre logo crushing the Munchkin logo. You will specify the size you want in the survey at the end of the project. 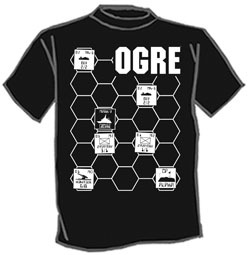 * "Ogre Endgame" Shirt – $20. A lot depends on whose turn it is! White on black. (US free shipping, and see new International Shipping below.) You will specify the size you want in the survey at the end of the project. * "Car Wars Pre-Support" Shirt – $23. Based on the original Car Wars cover, multicolored on white, saying “I Made Steve Jackson Work on Car Wars.” We expect this to ship separately and early. (US free shipping, and see new International Shipping below.) You will specify the size you want in the survey at the end of the project. If the shirt is all you want, pick it from the menu of reward levels, and not as an extra! Supporters at the $23 and $30 levels will get to choose between this shirt and the one below. * "Car Wars Classic" Shirt – $23. Based on the original Car Wars cover, multicolored on white, with no slogan. We expect this to ship separately and early. (US free shipping, and see new International Shipping below.) You will specify the size you want in the survey at the end of the project. If the shirt is all you want, pick it from the menu of reward levels, and not as an extra! Supporters at the $23 and $30 levels will get to choose between this shirt and the one above. 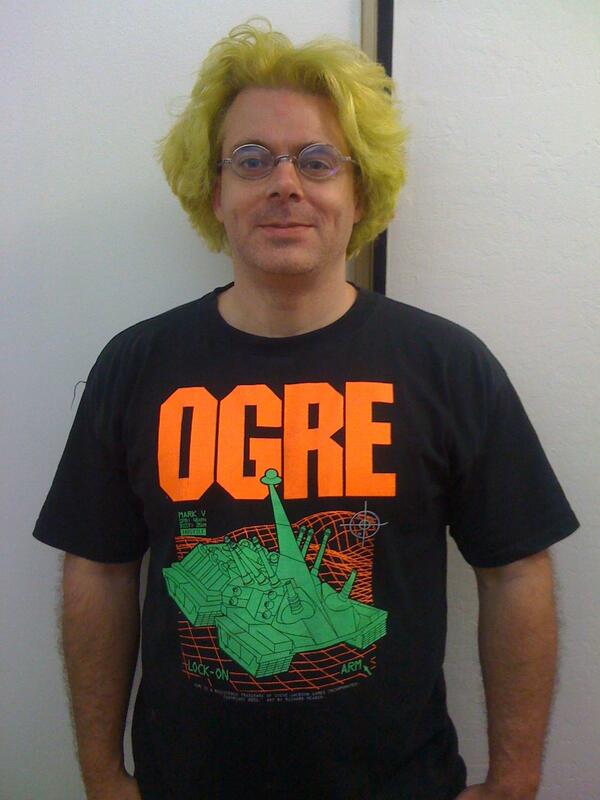 * "Ogre Green and Orange" T-Shirt – $25. Fluorescent orange and green on black. This is the one Steve is wearing in the intro video – or see below. (US free shipping, and see new International Shipping below.) You will specify the size you want in the survey at the end of the project. * Ogre Polo in adult 2XL, 3XL, or 4XL sizes - $35. Otherwise as above. NOTE that we have added this bag FREE to the US $150 support level, because that level didn’t have enough goodies. It does now! Made in-house on our own laser. Will look about like the big one in the photo, but with the detail from the little one. We don’t have a final sample to show you because it will take hours to set up and hours more to run each one, but it’s an in-house project, so we can get it right. Being wood, it’s paintable, stainable; whatever you decide to do. NOTE that because we reached our $200K stretch goal, you will get four one-sided maps instead of two two-sided maps. You will be able to create a hex battlefield of the size not seen since the glory days of SPI and GDW. * Extra Copy of the Game – $95. One more copy of Ogre. Only available if your basic support level includes just a single Ogre. This is provided at the request of (for instance) the people at the $200 Ogre-naming level, who wanted an extra copy of the game. Please don't order more than 2 of this extra, because we are limiting individual supporters to 3 each. US only, please. Here are three Extras, each representing a different-sized USPS Flat Rate box. Each gives two costs: one for Canada/Mexico, and the other for Everyplace Else. If you add one of these boxes as an Extra, that covers your shipping fees on whatever we can stuff into it. Some typical recipes will be listed under each Extra. If you order a box and no other Extras . . . well, please don’t do that. We will deliver this box to the USPS. It will go through your national customs and then, for good or ill, into the hands of your national postal system. This is “US Priority Mail." Note that a medium box is definitely bigger than two smalls, and a large is definitely bigger than a small and a medium, but two mediums are bigger than a large. Be sure to read the “substitutions” note after the Large Box listing. Sorry this is so Byzantine. Maybe we’ll find a way to make the next one better. In the meantime, do your best to calculate, and we’ll do our best to hold up our end. Canada/Mexico: $13. Everywhere else: $15. (You are not losing your mind; that number was $17 until it was pointed out that $17 represented an increase from the earlier rate for the smallest possible international "extras" order.) Untrackable and uninsurable. We will not send this size box to Brazil. Can hold: One shirt plus a couple of dice sets or pins, OR five sets of dice or pins. Maybe more, but let’s not promise more than five. This is a little box, so a counter sheet will not fit at all. NOTE: If you order a game from outside the US, and the only extras you order are pins, dice, and the Ogre Supporter T-shirt, and we can get your stuff into a Small flat rate box, shipping is FREE. The extras do have to be a separate shipment; we can’t get them into the carton with the game, but we won’t charge for that shipment. Can hold: One Giant Battlefield Set or Tournament Ogre Package plus 4 shirts and a couple of dice or pin sets, OR seven shirts plus a dice or pin set. Canada/Mexico: $30. Everywhere else: $51. See tracking and insurance notes for the medium box. Can hold: Two sets of maps (Giant Battlefield Set or Tournament Ogre Package) plus five shirts, OR one set of maps and six shirts, OR 12 shirts. OR this box can hold a single Ogre Canvas Bag, 2 shirts, and a few patches. We are now willing to say that one Extra Counter Set, including the Kickstarter extra counters, can replace one set of maps. A classic counter set would replace one shirt, perhaps leaving a bit of slack. Extra Kickstarter counter sheets are skinny, so figure that three of them would replace one shirt. Luckily, we have three to offer. A couple of dice or pin sets would replace one shirt. A woodkit set would replace two shirts. Four shotglasses would replace a shirt. Fewer than four should also be treated as replacing a shirt, to be safe. A hat would replace a shirt. $75,000 - GOAL ACHIEVED! Thanks to everyone who voted in the survey to choose the contents of this sheet. Another bonus! We will create a big Exclusive Kickstarter Counter Sheet and add it FREE to every Ogre game ordered through Kickstarter. 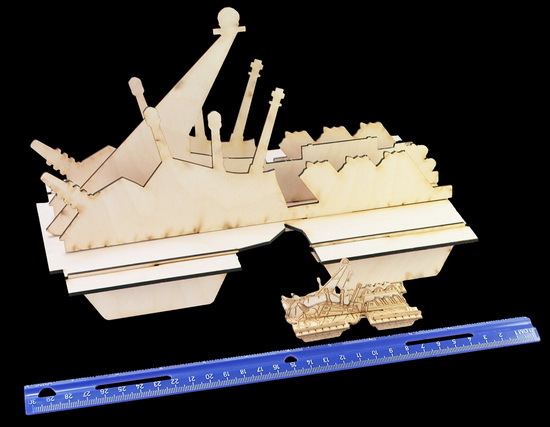 A double chipboard sheet (about 10" x 16") of 3-D counters, including a lot more buildings and one each Ogre Mk III and Mk V with graphics exclusive to Kickstarter supporters. The survey decided: The buildings will include a nuclear reactor and a lot of other things to shoot at, and the Ogres will be green. We call this sheet "Targets Go Boom!" $90,000 - GOAL ACHIEVED! Steve started working on the new scenarios last night . . . Four new Ogre scenarios designed by Steve Jackson will be posted to the SJ Games website: one each week during the month of November (the game’s release month). At least one of these will play off of something new introduced on the $75K counter sheet. $100,000 - GOAL ACHIEVED! A bonus for everyone! We will include the Ogre blueprint poster in every copy of the game, and we’ll announce at least one more stretch goal. $110,000 - GOAL ACHIEVED! Targets for your homemade Ogres! We'll post blank 3-D outlines for the Command Post, Laser, and Laser Tower, so your custom Ogres can have custom targets. And here they are. With line art: http://sjgames.com/ogre/img/ogre-pob-lineart.pdf. Without line art: http://sjgames.com/ogre/img/ogre-pob-noart.pdf. $120,000 - GOAL ACHIEVED! We'll post some pictures of acrylic vs. urea so you can see the difference you made. At this level, the game dice get much nicer for everyone. Instead of using the standard die material, urea (which is available in only a few standard colors), we will order a mold suitable for acrylic dice. This will increase our die cost, but we will be able to create the dice in many more (and cooler) colors, forever. $130,000 - GOAL ACHIEVED! You have totally proved to everyone that Steve can spend more time on Ogre. Steve is happy! 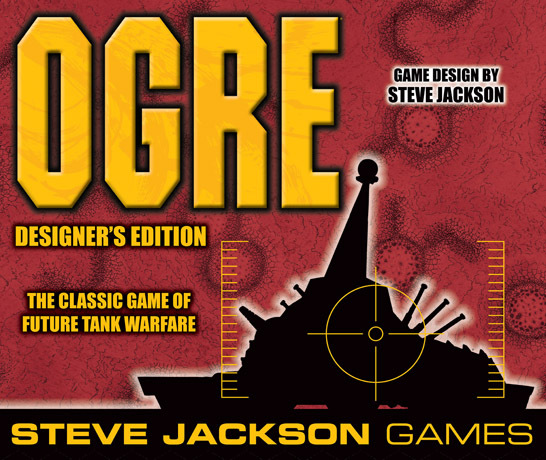 Four more Ogre scenarios by Steve Jackson will be posted during December 2012. $140,000 - GOAL ACHIEVED! And Steve was up late last night drawing overlays in his head. Now to find some paper . . . At this level, your game gets heavier (again). A new full-sized (not the 8" x 10" we first offered at this level) sheet of terrain overlays will be created and added FREE to every copy of Ogre. $150,000 - GOAL ACHIEVED! Now Phil has to schedule that container! Your support has earned you an early release for YOUR copies. At this point, we will have enough Kickstarter copies to fill a 40-foot container. So . . . that container will be the first one shipped out, and Kickstarter copies will start shipping two weeks before the regular release date. $175,000 - GOAL ACHIEVED! Phil, go to China, please, and talk to the factory! You have made the dice bigger as well as shinier. Instead of the standard 16mm dice in the original budget, we’ll go up to 19mm. And, of course, they’ll still be acrylic. $200,000 - GOAL ACHIEVED! Now we need to figure out what that did to box weight! You have made the game MUCH better for everyone! Instead of two double-sided maps, every copy of the game will include four single-sided maps. You will be able to use all four maps in a single game if you want to! Yes, print costs just went up a lot, but so did the awesomeness of the game, and your support made that possible. $250,000 - GOAL ACHIEVED! This is the level at which we use two containers! One 20-ft and one 40-ft container of games will come to Austin . . . and these will ship one month earlier than the distribution copies. $300,000 - GOAL ACHIEVED! We are now committed to releasing an Ogre computer game, for some platform or platforms, by the end of 2014. It might very well be a lot sooner. This is totally separate from the record sheet app, which will be free and come out before the boardgame ships. This is not an addition to any current reward levels - this is just something that your support and feedback has convinced us to do. $325,000 - GOAL ACHIEVED! We will release an Ogre expansion set late in 2013, with new units and at least one map. The pricing and contents will be determined by survey. Mmmm, surrrrrvey. We have had a number of requests for duplicates of the extra overlay sheet that was the $140,000 goal. So, having hit $350K, we will also “unlock” that sheet, print more copies, and put it in every set sold -- and we will offer it in W23 so you can buy individual extras. This means that the supporters' exclusive sheet will be one YOU voted on, instead of the one I had made up. But everyone still gets the one I made up . . .
$375,000 - GOAL ACHIEVED! - Translation! This goal is in honor of our Eurogamer supporters. We will make the rules and scenario book available, in PDF form, in one other language. The new survey lists ten languages where we know we will find a lot of gamers. Update: The survey is over. A translation will be released in German. $400,000 - GOAL ACHIEVED! - Pocket Ogre! By popular demand, a new “mini” edition of Ogre that will look a whole lot like the very first edition. We will send a copy to everyone who pledges $150 or over, regardless of what that support consists of - so Canadian and overseas supporters will automatically get one to say “thanks for paying all that postage”. This edition will eventually be sold in regular distribution, but not until the summer of 2013, so supporters can gloat over it for a whole year. $450,000 - GOAL ACHIEVED! - Okay! Somehow, some way, we WILL bring back the Ogre miniatures (and not just the Ogres themselves, but the whole line). Maybe resin, maybe metal. I have already gotten some interesting responses from custom casters. $475,000 - GOAL ACHIEVED! - We will run a scenario contest, pick at least four winners based on fun and balance, tweak them if required, and put them online. We will also combine them and the previous eight scenarios in a laid-out color PDF and make that file available (probably by DropBox) to everyone who supported at $25 or above. $500,000 - GOAL ACHIEVED! - Classic counters. Okay. We said we would never do these. You changed our minds. They will be available as an extra and in Warehouse 23. $525,000 - GOAL ACHIEVED! - We will replace the cardboard "Ogre garage" in the box with a heavy-duty vacuum-molded piece. More expensive, but you've told us you want it. To anticipate questions: We can probably order extras of these for W23, but not as part of Kickstarter. And they will not have separate lids, because really, the Ogres should be heavy enough that they won't just jump out. $550,000 - GOAL ACHIEVED! - We will start interviewing for a full-time Ogre line editor in the Austin office, because it looks like this game is back for the long haul. $575,000 - GOAL ACHIEVED! - We will put Ogre Miniatures, 2nd Edition on the schedule for late 2013, as both hardcopy and PDF. It will incorporate the material in the "update" PDF now available, as well as whatever gets developed as we work on Ogre over the next year. There will be new photos and new graphics. Good thing we will have a Line Editor! $600,000 - GOAL ACHIEVED! - I will come to at least two major summer/fall game conventions in 2013 (which ones? Still to be determined). The point is that at those conventions I will make Ogre my main focus, rather than That Card Game. I will run Ogre events, blow up your CP, and discuss what will be in the next supplement(s). $601,000 - GOAL ACHIEVED! - New unit added! For those who weren't excited by the convention goal above, here's a goal that specifically improves the set for all KS supporters. I will add the Heavy Weapon Team unit type to one of the Kickstarter exclusive sheets. Some counter sponsors want to put them on their sheets, too. This will be an improved (both clearer and more flexible) version of a unit that appeared only in Ogre Miniatures. Rules will be online, so as not to make the purchasers of regular editions go crazy looking for a counter that is not in the set. $651,000 - GOAL ACHIEVED! - Two more new units added! I will add (a few) Engineers to one of the Kickstarter exclusive sheets, plus a Vulcan. The Vulcan will be flat, matching the scale of the sheet of flat Ogres provided by supporter Michael Johnson - thanks, Michael! Preliminary rules for Engineers and Vulcans, developed from Ogre Miniatures, will go online when the set is shipped to you, and your reactions to those rules will shape the final version of the Engineers/Vulcans supplement . . . if and when you choose that as a release. Surrrrrrveys will continnnnnnue. $700,000 - GOAL ACHIEVED! - Drive Offensively! 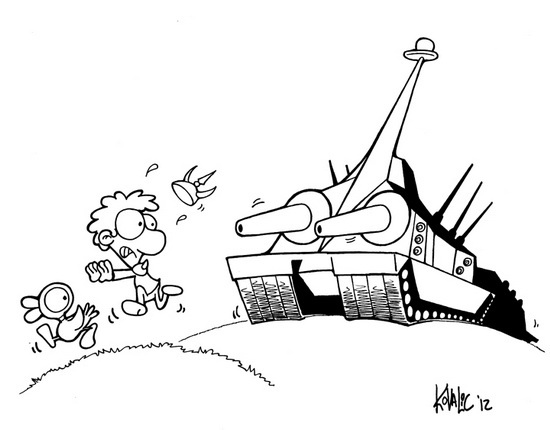 We will launch a Kickstarter project for Car Wars! We *think* this will turn out to be a refinement of Car Wars Compendium 2.5, but you'll tell us. Our supporters at the [new] $23 level and higher will be invited to join an exclusive Car Wars forum, where we’ll build the new edition from the ground up - issues like "which classic cover do we use?," "10 phase, 5 phase, or 3 phase movement?," and "do we include boats?" Once the project launches, surveys will be open to the public, but only supporters of the current project will get in on the preliminary planning. And we'll take everything we have learned from our Ogre Kickstarter project to make the Car Wars project even better. If we make this goal, the private Car Wars forum and surveys will launch before the end of 2012. The game will be published in late 2013. $750,000 - GOAL ACHIEVED! - Say thank you to the Car Wars fans, because they helped us to this probably-final goal for Ogre. Because you asked for this the most: we will cram one more exclusive Kickstarter sheet into your box. If it drives up shipping, we’ll eat the cost. Contents will be determined by surrrrvey (one option will be a 3-D Vulcan), and when we post it we’ll give you as much info as much as possible about the already-planned sheets so you know what you are already getting. That surrrrrrrrrrrvey will be posted AFTER the campaign ends - this page will still be here and we will keep updating! $782,000 - GOAL ACHIEVED! We have regained first place for Board/Card Game Funding. There was whooping and hollering. A video will be posted. Since you are being excellent to us, we will continue to be excellent to you in whatever ways we can - and we have already found a couple of ways to improve the project further - but there will be no more specific stretch goals. Support as you wish, tell your friends while there's still time, and it ends where it ends. This has been an incredibly successful campaign. Thank you all again! A buck in the tip jar - and makes you eligible to order some of the “extras” listed below (if, for instance, all you want is a shirt). Your name will be listed as a supporter on the Ogre website, and a PDF of the Ogre Miniatures rules (which is being slightly revised as a by-product of this project) will be e-mailed to you. Car Wars Supporter Level. You get the multicolored shirt that says “I Made Steve Jackson Work On Car Wars.” And, of course, access to the private forum if we hit the stretch goal! US only, please - but see $30. PLEASE NOTE that the Car Wars T-shirt is not a part of any other rewards, regardless of any previous "everything listed above" notes. Clearly we need to publish an update that is NOTHING but the spelled-out lists of what is available at what level. Thanks for your patience. The above, plus PDF copies of The Ogre Book and Ogre Scenario Book One. Car Wars Supporter Level, International. You get the multicolored shirt that says “I Made Steve Jackson Work On Car Wars.” And, of course, access to the private forum if we hit the stretch goal! The shirt will fit in a USPS International box and we can ship it anywhere at all. It will be possible to tuck Ogre dice or lapel pins into that box for no extra shipping. THE GAME! One copy of Ogre Sixth Edition, plus everything from the $25 level, AND your name on the box (on the side of the box bottom), AND a 4-color “thanks for your support” certificate signed by Steve Jackson. NOTE: If you prefer NOT to be listed as a supporter, please put this in the comments field! $151 - Read this if you supported at $150! There is no actual $151 level. This is a note to tell you that we have added an extra Kickstarter exclusive counter sheet (regular price $8) and an Ogre canvas bag (regular price $40) to the $150 US-only level. Of course, the $245 and $335 levels, which are based on the $150 level, also get one extra counter sheet and one canvas bag. As the $100 level, but you get TWO copies of the game. As the $150 level (that is, game plus swag), but you get TWO copies of the game. As the $100 level, but you get THREE copies of the game. For brick-and-mortar retailers ONLY! For $300, you will receive four copies of the Kickstarter edition of Ogre, one T-shirt, and one extra Kickstarter counter sheet so you can show off the constructible Ogres and buildings. Your store name will be in the list of supporters. NOTE that we WILL call, and/or confirm with distributors, and/or send MIBs to your address, to verify that you are a genuine brick-and-mortar store. Any unverified supporters at this level will receive two copies of the game and nothing else! So do NOT choose this level unless you can prove that you are a real, currently operating, brick-and-mortar retailer. NOTE ALSO that this has to ship to an address in the continental US, but the store itself does not have to be in the US. As the $150 level (that is, game plus swag), but you get THREE copies of the game. The $150 level, plus one of Steve Jackson’s own unopened archive copies of the FIRST edition of Ogre, with the Winchell Chung cover art. The first-edition copy can be signed, or left unopened - your choice. Sponsorship at this level will improve the rulebook by letting us hire a fantastic illustrator to do some character images. The $335 level . . . PLUS our artist, working from your photo, will put you into rulebook illustrations, and your name will appear in the credits. Depending on your own look and your preferences, you might be an officer, a trooper, a tanker, a refugee, a civilian leader, a technician . . .
You are sponsoring a whole 8" x 10” counter sheet, which will go into every copy of the game. We’ll work with you to determine what goes on the sheet and how it will be colored. The unit design will have to fit Ogre canon (no clown faces on the Superheavy Tanks, no overt advertising on the Ogres . . .) but that still leaves a lot of leeway. Your name will go on the sheet as sponsor, and we’ll send you at least a dozen extra copies of the sheet. This also includes everything at the $100 level. Your own exclusive 8" x 10” counter sheet. 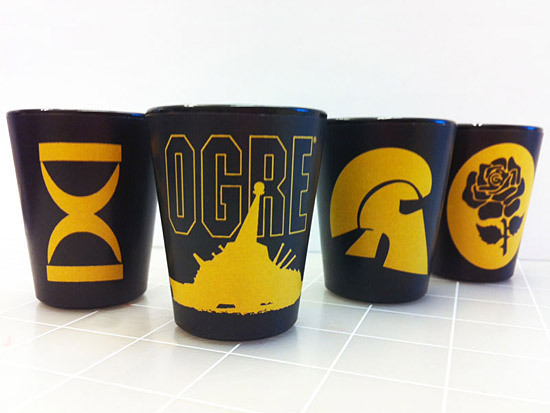 Want an Ogre with your logo on it? Want a squadron of pink GEVs? No problem. We’ll work with you on colors, design, and choice of dies. You’ll also be able to print your logo, name, or other stuff on the margins of the sheet. This could be a promo item for a convention, distributor, or big retail store. These sheets won’t go into the actual game. We will ship you at least 3,000. We’ll own the remaining copies but (unless you wish otherwise) they’ll stay in our warehouse for at least a year after the new Ogre game is released. If you want to resell your sheets, rather than just give them away, you’ll have to sign a licensing agreement to use the Ogre name and images, but that won’t cost you extra. Your Own Ogre Convention. 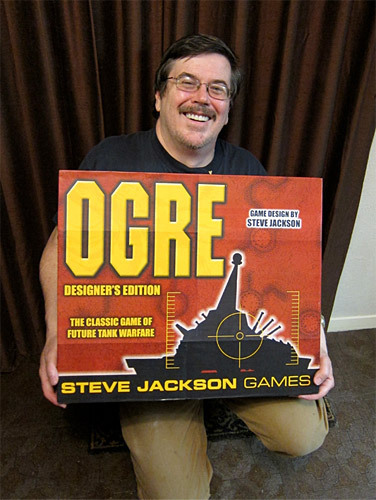 Steve Jackson will attend your 2-day Ogre event anywhere in the US or Canada (you can ask about other locations, but no promises!). You will need to cover Steve’s hotel and travel costs separately, and dates have to fit his existing commitments, so factor that in, and please talk to Steve directly (post a comment with your contact info) before you pledge! You also get four copies of the Kickstarter edition, your choice of $600 worth of Ogre swag or extras, and naming rights to one Ogre in the Designer's Edition as described for the $200 level. Steve will bring a large stack of party favors (including three of our prototype 3-D Ogres which you can use as prizes), run events, talk about upcoming projects, sign things, and other general convention stuff. Or you can do it as a house party and only invite a few people. Your call.